The predicted light snow did not happen. It's not cold enough. From the look of the nearby mountains, the snow level appears to have been around 300 meters above us. Here on the floor of the valley (really a section of the bed of prehistoric Lake Lahontan) in which Fernley sits, we had rain. Quite a lot of it by local standards, in fact. And because there's very little drainage here, it pools up where it can find low spots. Down the street from our house is the Imerys minerals (formerly Celite) plant that makes various diatomaceous earth products. 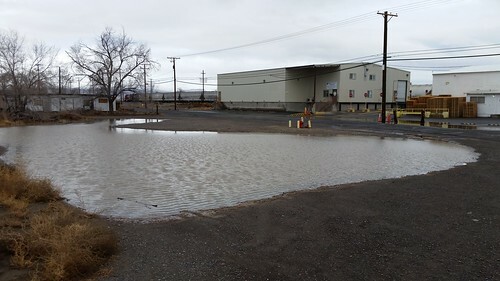 Across the street from their plant is an empty lot that when dry makes it much easier for big rigs to back into their small three-bay loading dock. But when it rains, it turns into what we call "Lake Imerys" and tends to stay there for a long time. 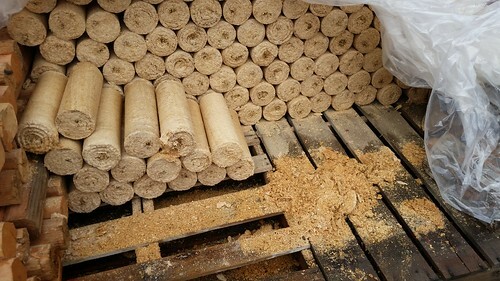 Closer to home, our large wood box is covered, and furthermore I've been covering the pressed-sawdust energy logs with plastic, and have lined the floor with pallets so that logs don't sit in a puddle if water does get into the box. However, what I think happened last night was that there was sufficient wind with the rain that it blew water through the front edge of the pallets lining the box and dissolved some of the logs on the bottom layer from below. The logs above were unharmed. I salvaged the pieces of logs that hadn't yet dissolved and will try to remember to cover the bottom front of the pallets when rain is forecast in the future. The rain trailed off this morning, and inasmuch as Lisa says we're not having this year's Christmas Duck until pretty late this evening, I had breakfast at the Wigwam. I expressed my gratitude to the staff working the holiday there, of course. A postscript to last night's Christmas Eve emergency services story: Ironically, about an hour later, there was a real search-and-rescue call for what sounded like someone who had driven out a road and got stuck where the pavement ended, but was no longer with their vehicle. I went to bed before hearing whether they found the lost person.